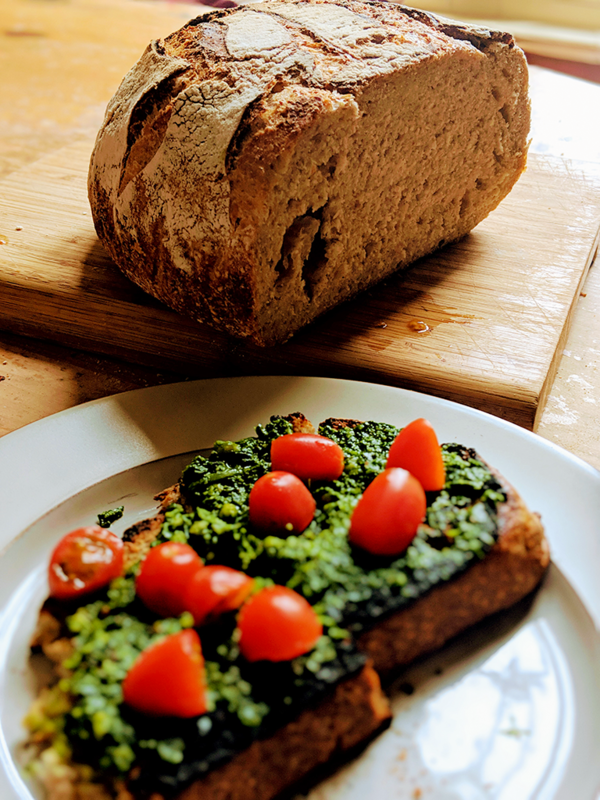 We are big fans of foraging at Torrisdale and Tracey has previously written about her culinary finds on the estate but I thought I’d share a very simple recipe for Wild Garlic Pesto that is becoming a staple in our house*. 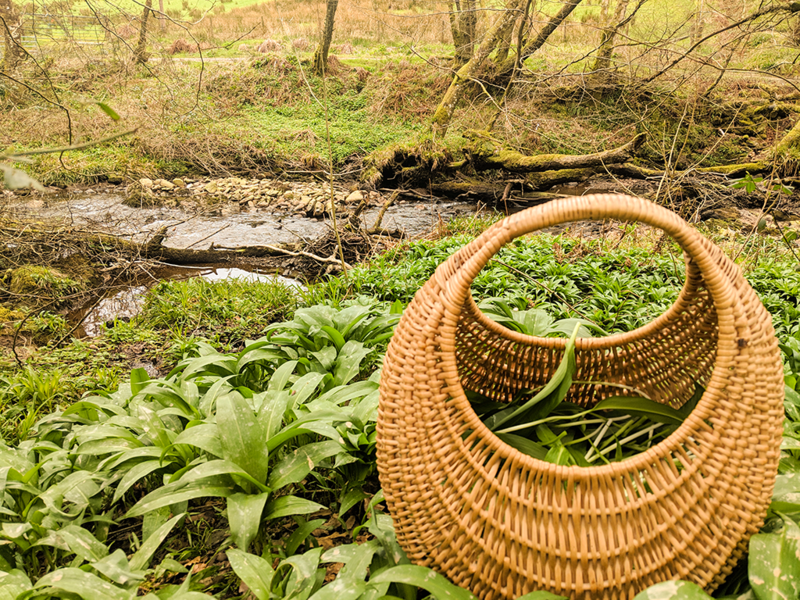 There is masses of wild garlic at this time of year. It starts appearing around mid-March and grows til around June but it is at is best right now when the leaves are bright green and the flowers haven’t opened yet. I quickly filled a basket and headed straight back to the kitchen to start work. It was lunchtime and I was hungry so there was no messing about. I washed the leaves thoroughly then spun them dry in a salad spinner and chucked them into my food processor. I glugged in some extra virgin olive oil and added a few more leaves. Pesto usually requires pine nuts but these cost a million pounds so I looked for an alternative in the cupboard. Buried under some kettle chips in the snack cupboard, I found a bag of mixed nuts left over from Christmas and chucked in a couple of handfuls. Instead of parmesan I decided to use up some manchego that has also been lingering since Christmas. I finely grated it and chucked that in too. Because the cheese is quite salty and the olive oil fairly peppery, I didn’t add any seasoning. Also, by this point I was starving so I dolloped it on a thick slice of toasted sourdough with some cherry tomatoes and scoffed it down in seconds (after the obligatory Instagram shots). Deelish! Who says there’s no such thing as a free lunch? (Apart from the olive oil, nuts and cheese). It was all guess work but I’ll attempt an actual recipe. 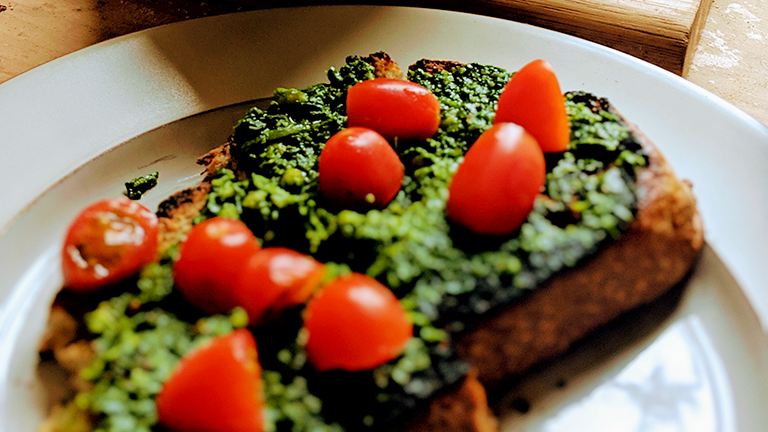 Blitz everything in a food processor and add more of whatever to taste. Spread liberally on homemade sourdough** and spend ages taking pictures for instagram before you finally scoff it. It’s also delicious as a sauce for pasta. I fried off some chorizo that needed used up (are you spotting a theme? ), added some wild garlic pesto then stired it into some tagliatelle. Niall was slightly suspicious but admitted he really quite enjoyed it.